We're delighted to share the story of John's passion for marquetry that started in a class at the School. Taken a class that has inspired you? Feel free to submit your story. Over the history of my woodworking efforts I learned that I was able to follow plans and build just about anything I wanted to build. Although we soon ran out of room in our home for new pieces that I continually turned out, I came to a point where I recognized that something original, something artistic and creative was missing from my projects. It was at that time that I enrolled in a marquetry class at the Port Townsend School of Woodworking. There were five in our class, five students from completely different walks and stages of life, but we all had the interest and desire to go one more step in our woodworking lives. The class spanned five days and I soon discovered marquetry, inlay and veneering as skills I wanted to develop, in the hope that I could add them to those I had already been using. The tools are different, the materials are thinner and more fragile the work at times tedious but the possibilities are enormous. Tim Swanberg was the instructor for our class and, like all the other instructors I have had at the Port Townsend School of Woodworking, is gifted, skilled and possesses the ability to transfer the information from his head to mine; one of the characteristics of a effective teacher. I view marquetry as an art form that lends itself quite well as a tool to probe the creative and artistic elements of my persona. It provides an opportunity to add a distinctive touch that can set a project apart from the others, to add a little additional "class" or "pizazz". It's only fair to add that, for me anyway, marquetry is one of the more demanding disciplines I have set my mind on doing. Since taking the class in July of 2012 my own personal woodworking path has taken a definite change. I now invest my time primarily in making smaller items than I built before. Although I have added inlay and marquetry to a few table tops, I now make primarily wooden boxes, trays etc. These past few years I have, indirectly through books and DVD, learned more of marquetry from the likes of Paul Schurch, Silas Kopf, Doug Stowe, Jack Metcalf and John Apps. Learning through books and DVD is very helpful in getting an overview and some basic exposure to an area of study. To be in a classroom with a master craftsman with an opportunity to get one-on-one instruction is the chance of a lifetime. I have found that marquetry takes a well crafted wooden art form to a different level of personal expression. A box or a tray becomes a canvas for something just a little bit more than a box or a tray. 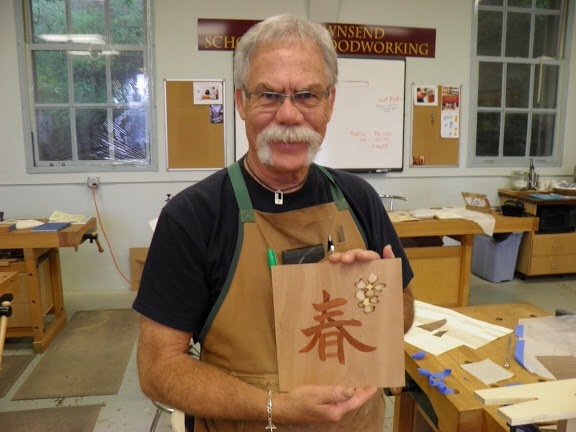 Beginning Marquetry, with Tim Swanberg, is June 20-24, 2016! By Hand and Eye - the Movie!